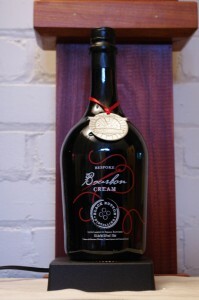 A very well done and excellent cream liqueur with a lot of well balanced flavor. Notes: Black Button is a new craft distillery that opened in Rochester, New York January 25, 2014 and is the only distillery currently within th city limits of Rochester. Located on ht doorstep of the Rochester New York Public Market and next to the Rohrbach Brewing Company, Black Button produces a number of different products including a gin ,bourbon, vodka, and a fernet along with some seasonal expressions ( one of the first being their Lilac flavored gin – an homage to the Rochester Lilac Festival). They also have a three and a five day distilling course for people wishing to learn the rudiments of distilling and many of the ins and out of the distilling trade. This, their Bourbon Creme is a mix of their bourbon, cream liqueur , and a touch of caramel coloring . Appearance: Caramel cream/light tan colored with only the slightest separation of ingredients pouring ( not an easy feat to keep a cream liqueur so well homogenized) on swirling the tan colored liquid forms a paler swirl line then forms some legs. First Impression: Dairy cream, egg,vanilla, bourbon,cinnamon, allspice, touch of nutmeg,caramel/molasses notes over all a nicely rich and enticingly spicy cream. Taste: Very well done, creamy with baking spice,cream and bourbon with a creamy,spicy entry and a good slightly aromatic finish. Not at all like some cream liqueurs that can cling like grime death to your plate. Bottle: A very dark green brown glass to protect the contents from light, in a bell shipped brandy type bottle . Graphics and lettering are silkscreened directly onto the bottle on the front. Rear labeling has a definition of bespoke and the story of the liqueur.Bottle is topped with a black anti tamper neck capsule and a synthetic cork ( cleaner and better seal than a natural one – especially with a cream liqueur) that has a ridged plastic top for easier grip and opening, with the Black Button Distilling logo on the top which is both attractive and makes it easy to spot in a speed rack or other storage from above. Overall an attractive package that is distinctive and makes for a good gift to give or receive. Other: Bespoke has one a number of awards lately, and beaten one of the industry leaders in one judging recently . Final Thoughts: A touch pricey compared to the very mass produced cream liqueurs produced in industrial quantities by other brands, but those liqueurs trend to taste industrial too, along with using chemicals that i would not put into the radiator of my car, never mind my body or my friends bodies. Hand made in small batches with natural ingredients and nicely flavor forward makes the Bespoke Bourbon Cream a standout.